More than sixty people from all over Europe came together at the C-Base in Berlin for the 10th Wireless Community Weekend, the most important meeting of the year for Germany’s Freifunk groups. Wonderful weather, a relaxed atmosphere and interesting lectures made for a productive weekend with lots of lively discussion, as shown by the feedback from Twitter surrounding the WCW. There were many new faces from newly created groups. Alongside the recently founded groups, such as Magdeburg, Padeborn and Lüneburg were activists from all over Germany. Of course, the “usual suspects” from Berlin, Leipzig and Weimar played their part, as well as Developers from openWRT and OLSR. We’d also like to thank our sponsors and helpers as well as the c-base members for their hospitality and support. 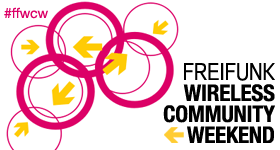 How can we improve the cooperation between our communities and share resources whilst maintaining the decentralised structures of Freifunk? How can small or young communities profit and learn from the experiences of larger, established communities? The panel discussion on organisational structures emphasised the diverse views within the community and the importance of decentralisation whilst underlining the desire to deepen the existing collaborative efforts. Which strategies should we pursue in using the IPv6 address space? The subject is complex and offers many, sometimes conflicting, alternatives. As part of a pilot project, communities in Berlin, Lübeck and Weimar have been provided with addresses from the IPv6 pool so that they can try various scenarios and share the knowledge gained with other groups. Another lecture covered the latest developments in the Freifunk API. A Project born of the Google Summer of Code that supports us in searching and processing data. The specifications and technical solutions surrounding the distribution of Freifunk templates of all kinds were discussed, as were public relations materials. A further lecture covered the technical challenges involved in meshnetworks with wired and wireless segments and their solutions. A Workshop was held dealing with offering decentralised services and storage whilst sharing these resources. The Installation of Friendica as an open and decentralised alternative to Facebook and its configuration as an Internal and external service. Last but not least: What is the legal situation? What have we achieved? How do we get predictability in legal decisions? What is the significance of a legal declaration on Freifunk. Information on the lectures and workshops can be found in the Wiki. Beyond that we worked on firmware, web Interfaces and written materials, we installed services, created podcasts, talked and, most importantly, barbecued.